The Auburn Pioneer Cemetery, located at 8th NE and Auburn Way North in Auburn, Washington, contains monuments for several early Auburn-area settlers including many of the Japanese and Japanese-Americans who resided in the White River Valley prior to World War II. It is part of the Auburn cemetery system and is under the care and supervision of the Auburn Parks Department. The cemetery is closed to new burials except for inurnment of cremated remains of family members of those already buried in the cemetery. The Auburn Pioneer Cemetery has previously been called the Faucett Cemetery, the Cemetery at Slaughter, and the Japanese Cemetery. Although the date above the entry arch reads 1878, burials actually took place at the cemetery much earlier. We know that John and Rachel Faucett began using the land as their family burial plot when they lost two young daughters in early 1866. The Faucett family monument graces the earliest marked graves in the cemetery (and is the reason why the cemetery was known as the Faucett Cemetery in its early days), but there is some suggestion that burials had taken place on the land even earlier. The community at large soon joined the Faucetts in burying their loved ones at this peaceful crossroads just north of town. According to notes on an early plat map of the cemetery, the land was originally donated for use as an official cemetery in January of 1878 by Charles A. Williams and his wife Mary, then of Linn County, Oregon. The map also illustrates how full the cemetery became in the years prior to 1900. Many of the Valley's earliest and most prominent pioneers were represented among its graves. Unfortunately, situated as it was between the Green and the White Rivers (before the latter's diversion in 1906), the cemetery was particularly vulnerable to flooding. At least one report states that the flooding was so severe at times that burial vaults were left open when the waters receded. Once the Auburn Mountain View Cemetery was opened in 1890, many families began to move their deceased ancestors to this and other cemeteries on higher ground. Causasian burials became increasingly rare at the Pioneer Cemetery; the last such burial took place in 1935 (flooding concerns at the cemetery weren’t fully resolved until the construction of the Howard Hanson Dam on the upper Green River in 1962). The first Japanese burial in the Auburn Cemetery was that of Hikane Ito, an infant who died in 1890. The baby was buried in the backmost corner of the cemetery—an area that gradually evolved into the cemetery’s first Japanese section. This area eventually consisted of three short rows that were set perpendicular to the rows of graves in the main part of the cemetery. Baby Ito's burial was dutifully noted on the official cemetery plot map; however, from that point forward the cemetery records bifurcated; the Buddhist Church tracked the Japanese burials and cemetery trustee James Hart (and later undertaker George Scott) recorded the locations of caucasian burials. In terms of record keeping, after 1890, the cemetery essentially became two separate, although overlapping, cemeteries. As Japanese settlement increased, the need for additional burial space for the community grew too. The frequent flooding at the cemetery discouraged many white families from continuing to use the cemetery for full-body burials, as was the tradition of their Christian community. As new, nearby cemeteries opened and Caucasian families began to move their ancestors out of the Auburn Pioneer Cemetery, many rows of the Cemetery were left vacant, or nearly so. Perhaps because the local Japanese residents were mostly Buddhists (and therefore practiced cremation and inurnment), flooding was somewhat less of a concern for the Japanese; furthermore, most the Valley’s Japanese residents were farm laborers with little money to purchase burial plots in more desirable cemeteries. In 1917, a 25-foot-wide strip of land running north to south along the cemetery’s eastern edge was deeded to the White River Buddhist Church for the use of the Japanese community. They began to fill in the new rows, in most cases using the plots adjacent to the original Japanese section first. In exchange for these rows, the Japanese community took on the care and maintenance of the cemetery from that point forward. Most of the early Japanese burials were marked originally with wooden sticks or columns. In fall of 1928, Rev. Giryo Takemura (minister of the White River Buddhist Church from October 1925 to June 1932), with the assistance of Chiyokichi Natsuhara (who was to become Rev. Takemura's father-in-law the following spring), created concrete markers to replace the early, perishable wooden markers. Thereafter, Auburn’s Japanese families could purchase a similar marker, complete with base, for seven dollars. Today most of these early concrete markers—many in a deteriorated state—are still in place as the sole markers of their respective graves. Unfortunately, even those that remain legible (after many decades of weathering) are incomprehensible to non-Japanese speakers since they are inscribed with traditional Chinese characters (kanji). Adding to the confusion is the fact that some families would inter additional cremated remains in a plot that they had previously purchased and marked for another, earlier family member; these communal burials were seldom marked with all of the occupants’ names. After the bombing of Pearl Harbor at the end of 1941, the West Coast’s Japanese residents came under increasing suspicion from their white neighbors—a suspicion that grew to near hysterical proportions. Even the American-born Nisei generation—often young adults who had never had the opportunity to even visit Japan—were considered potential spies for the Japanese Empire. All of the West Coast Japanese—regardless of their citizenship—were forcibly removed from their homes in early 1942. They were sent to assembly centers while they waited for more permanent internment centers to be built. In the case of the White River Valley Japanese, most families were sent first to California’s Pinedale Assembly Center before being moved to either California’s Tule Lake and/or Idaho’s Minidoka Internment Center for the remainder of the war. In the absence of the Japanese community, the Auburn Pioneer Cemetery was largely left to the vagaries of nature and petty vandals. Chiyokichi Natsuhara attempted to do what he could for the cemetery from Tule Lake, taking up collections from his fellow-inmates to help maintain the family burial plots back home. 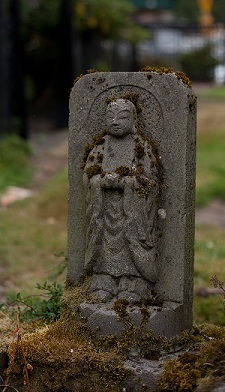 Nevertheless, on the Natsuharas’ eventual return to Auburn, they found the cemetery choked with weeds; many markers were damaged or missing entirely. The Natsuharas were an exception; most families did not have the means to return to Auburn and restart their lives here after the War. According to the White River Valley Musuem, approximately 300 Japanese families had lived in the Valley prior to internment. Only about 25 of these families returned when the internment centers were closed at the War’s end. 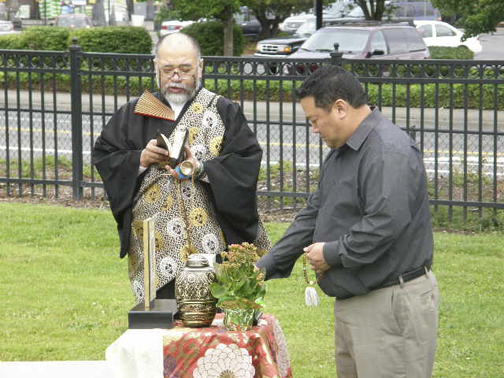 Probably in the early 1980’s, Terada Family descendant Allan Terada created a “key” to the Japanese burials in the Auburn Cemetery. A transcript of some of the kanji on each of the Japanese-language stones was recorded along with the corresponding family name in romaji (English). However, it appeared that several of the individual kanji transcripts could reveal more than just the family name if fully translated. Unfortunately, any additional information—beyond the family name—was not translated on the “Key” created by Mr. Terada. This transcript, along with additional research by Hilda Meryhew, was published as Volume IV of The Memorial Records of South King County, Washington. Most of the transcriptions of the Auburn Pioneer Cemetery that have been published online are based on this volume. Unfortunately, this means that in most websites the earlier Japanese graves are identified only by the occupant’s last name—no further information is included. We have attempted to remedy this situation by publishing full translations (in most cases) here in our Japanese Burials section. By this period, the City of Auburn had taken over the care and maintenance of the Cemetery (prior to this time, Chiyokichi Natsuhara, and later his son Frank, had served as volunteer caretakers for the cemetery, working tirelessly to restore and maintain it). In 1997, the City of Auburn erected the decorative archway and fence panels that grace the cemetery’s entrance. Artist Deborah Mersky incorporated Japanese crests, hop vines, and other familiar symbols into its design. In early 2011, the City of Auburn announced that the stately maple trees bordering the cemetery would be removed and replaced. The enormous maples, although beloved by generations of Auburn citizens, had become a hazard to both pedestrians and car traffic along Auburn Way North. Over the years, the trees had been improperly pruned away from the street, causing them to gradually become lopsided and dangerous. Additionally, some of the elderly trees had become diseased, making them even more likely to drop heavy limbs or fall over without warning. As arborists began to make their first cuts, some of the trees literally poured water from their trunks, confirming that it was well past time for the trees’ removal. A new maple variety was carefully chosen to replace the original trees, one bred specifically for urban environments. It will take some time, but these trees should eventually grow to be as grand and beautiful as their predecessors. Maki and Mae Yamada's inurnment ceremony, July 2011. Photo by Robert Whale, The Auburn Reporter. Although many of the families represented in the cemetery are no longer living in our area, the cemetery continues to be well cared-for and used even today. Most recently, Mae Yamada, a much loved and respected Auburn elder, along with her husband Maki, were buried in the cemetery on a warm summer afternoon. A new, black granite tombstone now marks the couple's final resting place. It is sure to be joined by others in the years to come. Do you have any additional information about the cemetery? We would be happy to hear from you. Please feel free to contact us by email.